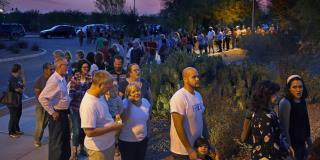 (Newser) – Long lines at polling sites in Arizona's March 22 primary led Phoenix Mayor Greg Stanton to call the night a "fiasco"—and the Justice Department to now investigate whether there were civil rights violations regarding what Stanton called "unacceptably disparate distribution of polling locations," Reuters reports. The DoJ's civil rights division penned a letter Friday asking Maricopa County, the state's most populous, to determine if federal law was violated regarding, among other things, the number and location of polling sites (the county cut them from 200 to 60 in 2012 in an apparent bid to save money). The Justice Department's reason for this request: reports of "disproportional burden in waiting times … in some areas with substantial racial or language minority populations," the letter noted. This administration has a special DOJ task force constantly looking for ways to investigate Maricopa County for violation of so-called civil rights which actually means U.S. citizens have no rights over illegals. White racists feel they are losing ground due to the people they elected. They also feel the minorities are gaining at their expense. How nice to see the other shoe drop.